The Office of Codes Enforcement is responsible for enforcement of Borough ordinances dealing with building construction, property maintenance, and other non-criminal laws. The Borough’s Codes Enforcement Officer is responsible for the administration and enforcement of those laws. He is assisted by his designated, part-time, assistants and third-party agencies which are retained by the Borough to act on the Borough’s behalf. Under Ordinance No. 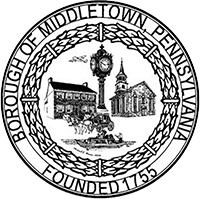 1177 of 2004, the Borough of Middletown has elected to administer and enforce the provisions of the Pennsylvania Construction Code Act, The Uniform Construction Code, the International Property Maintenance Code, the IEEE International Electrical Safety Code, and the NFPA 70 National Electric Code Standard. The Code Official issues all necessary notices and orders to abate illegal or unsafe conditions to ensure compliance with the Borough’s laws regarding the safety, health and general welfare of the public. That authority includes authorization to enter any structure, premises or exterior property area at any reasonable time for the purpose of making inspections and performing his or her duties. The Code Enforcement Officer’s duties also include the receipt of applications; the issuance of permits, notices, certificates and orders; the making of inspections to determine conformance with applicable codes and ordinances; the undertaking of systematic inspection programs; the undertaking of research and investigations; the recommendation of appropriate administrative rules for review and adoption by the Code Hearing Board; the keeping of records; the issuance of written annual reports; and such other activities as may be required.